I’ve got ratatouille on the brain. Not Ratatouille (affiliate link), the movie (though it was delightful)! 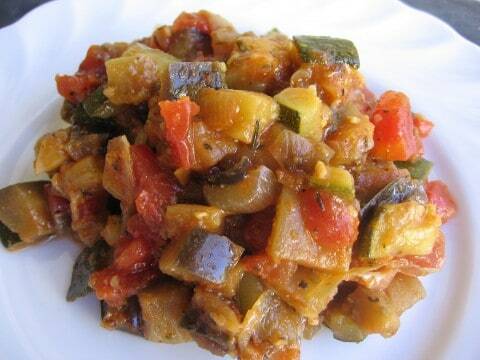 What I’m thinking about is ratatouille the southern French vegetable dish that originated in Provence, France. I crave it each summer when all the vegetables required to make it – eggplant, tomatoes, onion, bell peppers, and zucchini – are plentiful and full of flavor. 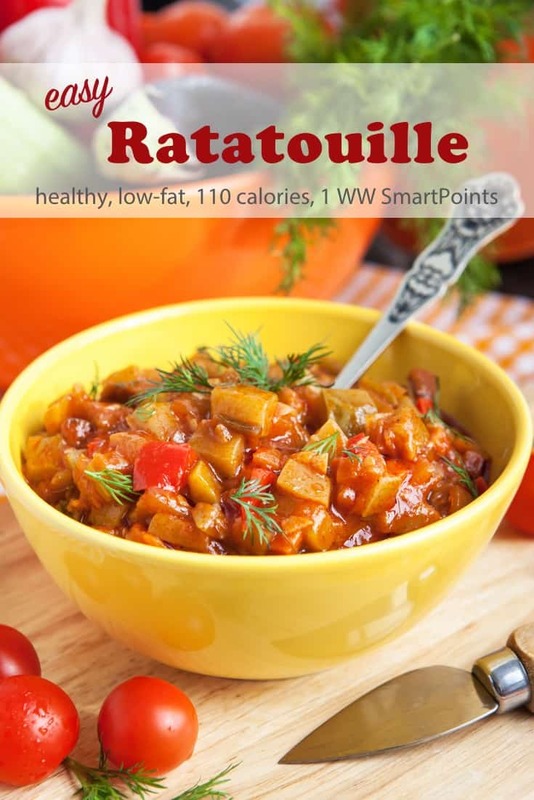 Just this morning I was thinking about it, putting together the ingredient list in my head, as I was making my way over to More Time at the Table and discovered Alyce’s post for her version of ratatouille. You can use ratatouille so many ways. It’s a sensational side dish for chicken or fish, a tasty topping for toasted bread, pasta or polenta, and a fabulous filling for omelets and crepes. Or try it as a base for poaching eggs. There are lots of different ratatouille recipes, some are roasted, others are simmered on the stovetop or in the slow cooker – so feel free to make it whatever way suits you best. 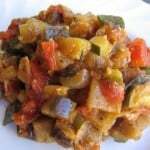 Many traditional ratatouille recipes are fussier than this one, suggesting that you cook each vegetable separately. This is an easy version from one of my favorite cookbooks of the moment – 5 Easy Steps to Healthy Cooking: 500 Recipes for Lifelong Wellness (affiliate link) – that only uses 2 teaspoons of olive oil, so it’s low-fat and extra Weight Watchers friendly. According to my calculations, each serving has just 110 calories, *3 Weight Watchers PointsPlus. *1 WW Freestyle SmartPoint. If you’ve made this ratatouille, please give the recipe a star rating below and leave a comment letting me know how you liked it. Easy summer ratatouille recipe you can use in so many ways, as a side dish for chicken or fish, as an appetizer on toasted bread, filling for an omelette or crepe or topping for pasta. Chopped kalamata olives, capers, and fresh parsley are great additions, just remember to adjust the WW points accordingly. Heat the oil in a large skillet over medium-high heat. Add the garlic, red pepper, onions and herbes de Provence, and cook, stirring occasionally, until softened, 6 to 8 minutes. Add the zucchini and eggplant and cook, stirring occasionally, until softened, about 5 minutes. Add the tomatoes and their juice, water and salt and pepper to taste. Bring to a boil and then reduce heat to low, cover and simmer, stirring occasionally, for 20 minutes. Uncover and simmer, stirring occasionally, until the mixture is thickened, 15 to 20 minutes more. Remove from the heat and stir in the vinegar. Taste and adjust seasonings. Previous Post: « How Do You Keep Track of Your Meal Plan Ideas? 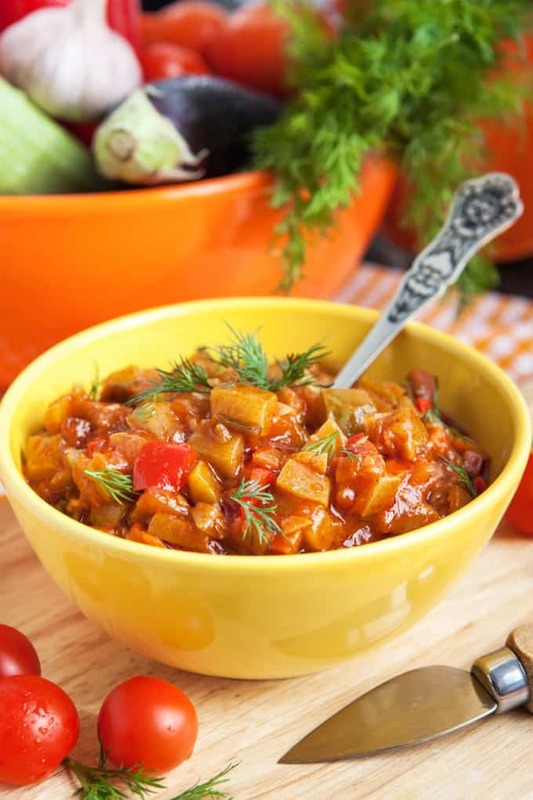 Ratatouille is one of my favorite summer dishes – great way to use all of summer’s bounty!